It’s too easy to fall into the trap of thinking that certain foods are healthy and certain foods are laden with calories. When you’re trying to eat and enjoy low calorie meals, it’s important to arm yourself with the correct information to make the right choices. Here are some popular meals that can often have loads of hidden calories, even if you think they’re a relatively healthy meal. Follow the tips for uncovering the hidden calories and you can enjoy your meal without guilt! Soup can be a low calorie fan’s friend if you make the right choices, but not all soups are created equal! 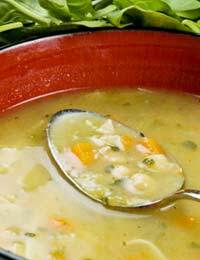 Even if a soup sounds healthy, unless you’ve made it yourself you don’t know what calorie-laden ingredients have been used. We can all tell that a ‘Cream of…’ soup is likely to be high in calories, but what about the one’s that sound healthy, like celery soup, or Thai vegetable soup? The first thing is to look at the consistency of the soup – if it’s thick, it’s likely to have cream, butter or cheese blended in, unless it’s used potato to thicken. Thin soups tend to be lower in calories, although clear is always better because it can’t have cream added. Broth-type soups are the best choice as they usually have plenty of vegetables and very little fat – just stay away from the bread basket or the dumplings! Thai soups often have coconut milk added, which is a relatively healthy ingredient but certainly higher fat that other Thai options, like hot and spicy Tom Yum. The massive variation of calorie content in different types of curry is really eye opening when you’re trying to watch your weight! You don’t have to cut out your love of spicy food, but you do have to know the difference between a korma and a dopiaza! A simple rule of thumb is to choose tomato based curries over creamy curries. Highly spiced tomato and onion based curries are great for low calorie eating – they’re packed with flavour and nutrients without packing on the pounds. Just make sure that you choose boiled rice over fried rice and say no to naan bread. Remember that creamy curries get their texture from very high calorie ingredients like ground nuts, double cream or lots of clarified butter. A butter chicken dish can easily be triple the calories of a jalfrezi. When you’re making your own curries from scratch at home, try frying the spices in just a teaspoon of oil or butter, even if the recipe says to use more. Although the finished dish won’t be quite so rich, you can get all the flavour for far fewer calories. Just because you choose a salad doesn't mean you've gone for the healthy option! All too often salads are packed with high calorie ingredients like fried croutons, oil-laden dressings and bacon pieces. In many restaurant chains, the salads actually pack in more calories than the 'obviously' high calorie options, so either ask for the dressing on the side or choose another option. Rice sounds like a low calorie food, but it can be packed with hidden calories, especially in takeaways and restaurants. Whereas boiled rice has just 150 calories per 100g portion, egg fried rice has more than double, at 310! Pilau rice is even higher in calories, at 325 per 100g, thanks to the hidden butter and oil. Rice salads can also pack a calorie punch, with oily dressings and fried ingredients like bacon pieces often included. It’s still nice to have a pudding even when you’re trying to eat low calorie, so it’s good to know what sweet treats you can enjoy. It’s obvious that fruit is the best low calorie choice, but did you know that many ready prepared fruit salads have syrup over them that’s basically pure sugar? Just because you choose a fruit pudding it doesn’t mean it’s low calorie, which may mean that you eat more because you think it’s healthy. Unless you’ve prepared the fruit yourself, it’s best to stick to mousses and jellies, or, even better, just have a little spoonful of something really decadent and enjoy it! It's amazing to think that you could consume more than three times the calories during a few drinks depending on what you choose. We all know that creamy cocktails are far more calorie laden than a clear spirit with a diet mixer, but did you know that a pint of strong cider has more than 500 calories whereas a pint of draft lager has only 190? It's also worth bearing in mind that the hot and cold drinks available in the high street coffee chains vary enormously. Rather than ordering a calorie-packed iced coffee with cream, syrups and full fat milk, ask for skimmed milk and have an extra shot instead!